This Laguiole table knife of Studio Design W. combines pure and elegant lines with a stylized bee and neon bright colors. The design of the polished knife handle is realized in an exclusive material, Dacryl® , that meets the most rigorous quality criteria. This multicolored Laguiole knife is brightly colored revolution led by Jean-Michel Wilmotte within Forge de Laguiole. 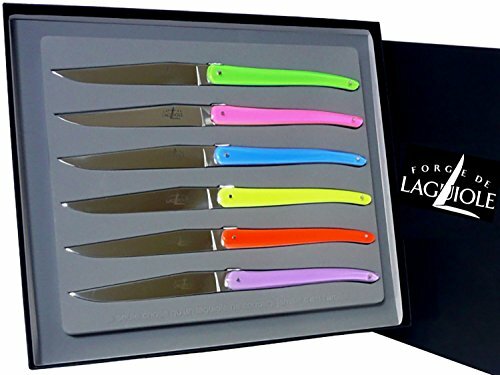 Multicolored Laguiole table knives with acrylic glass handles, shiny finish. Every steak knife will be sent with a prymo.de blade shield - 100 % made in Germany. You can choose the color and set size (one, two ore six knives). Every steak knife will be sent with a blade shield by prymo.de - 100 % made in germany. Forge de Laguiole table knife with acryl handle - handmade in france. Design by Jean-Michel Wilmotte. Handle of Dacryl in various colors: black, white, red, yellow, blue, green, rose, purple,.. The T12 stainless steel blade has a shiny finish. Forge de Laguiole manufactures high quality pocket knives and tableware - made in laguiole / france. Every Forge knife will be sent with a prymo.de® blade shield - made in germany. If you have any questions about this product by Forge de Laguiole / Prymo.de®, contact us by completing and submitting the form below. If you are looking for a specif part number, please include it with your message.